This Alien Spaceship Orgone pendant is made for those who resonate with any ET race. I do believe that each and every one of us has alien DNA as a part of our genetic makeup. 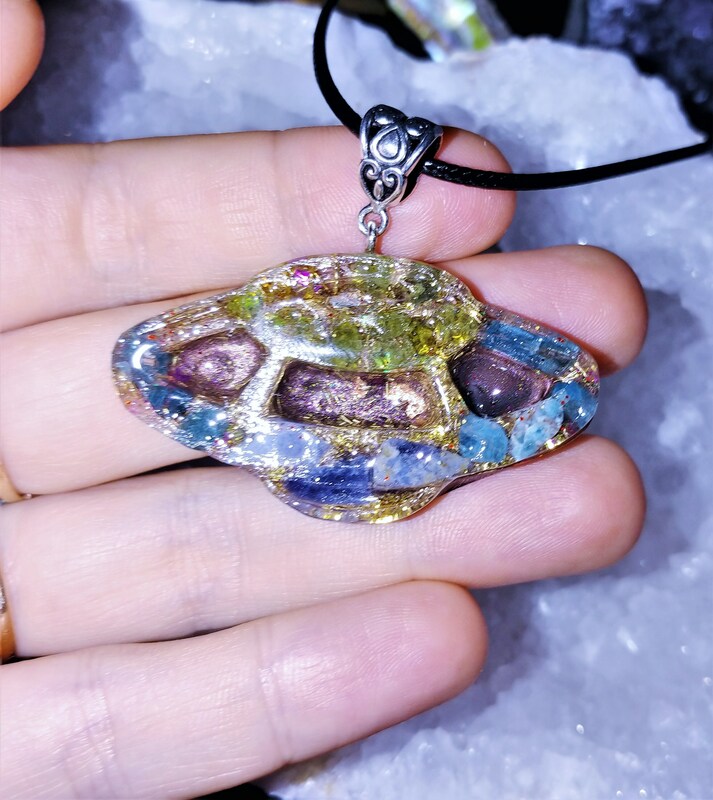 I often listen to channellings from different beings and wanted to create an Alien Orgone Pendant for a long time. So here it is! It contains Clear Quartz wrapped in copper wire, Blue Apatite, Peridot, Dumortierite, Shungite powder, Pyrite sand, clear quartz crystal powder, copper coils, mica, 24 k gold leaf, tesla coil, red copper coils metal shavings, Reiki healing energy, Love and Light, 528 Hz frequency. I just love this spaceship. I loved that it arrived with a beautiful handwritten note. I Love your creativity! !